Jobseekers are being invited to a jobs fair taking place on Friday 5th October 2018. The event, which is being hosted by Community Together CIC, is taking place at St Peter’s Church in Hawksworth from 11am to 2pm. Employers from various sectors will be in attendance with vacancies available in retail, catering, care services and wholesale, along with training and apprenticeship opportunities. CT CIC volunteers will also be on hand offering help and guidance on writing CVs and cover letters as well as support to find and apply for the right jobs. 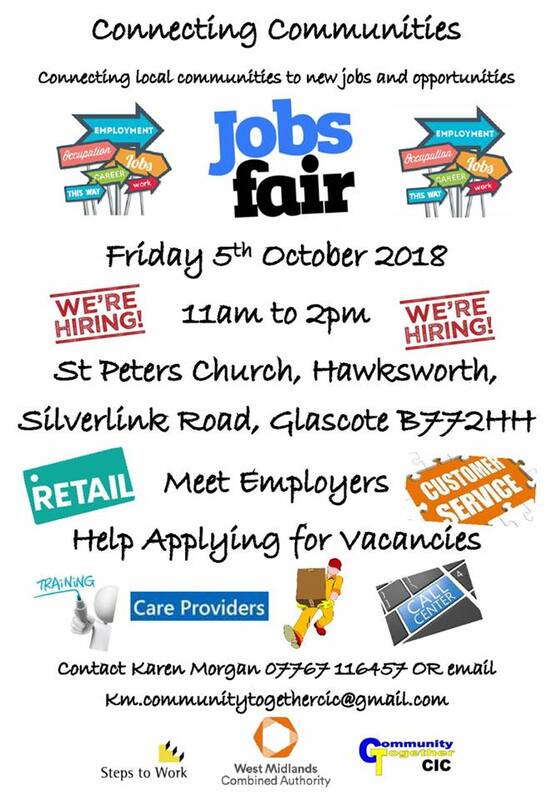 Project Lee Bates said: “We’re excited to bring this jobs fair to Glascote and hope as many people as possible turn up and take advantage of the many opportunities on offer. For more information about Community Together CIC’s jobs fair email Karen Morgan at km.communitytogethercic@gmail.com or call 07767 116457.